And yes, I'm still on a purple kick. 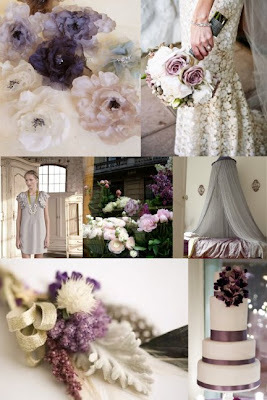 This board plays up the vintage qualities of purple- utilizing more subdued shades of the color mixed with foggy grays and almost white blushes. Maybe it's the flower shop window or the simplicity of the cake, but this board completely reminds me of Paris. To me, it's a place where even the foggiest of days are magical and full of beauty.